Bad news keeps piling on for Qualcomm. Beijing has branded the U.S. chipmaker a monopolist, even as its dominance, which rests on smartphone chips and 3G patents, may be sliding. If that weren’t enough, some Chinese customers aren’t paying their dues. As friction over U.S.-China spying persists, things may only get worse. Qualcomm’s status as an American company that makes almost half its revenue from the People’s Republic already puts it in the limelight. The National Development and Reform Commission has been investigating whether Qualcomm used market dominance to price patent licences unfairly, according to people familiar with the matter. Though the investigation isn’t finished, the watchdog took the unusual step of declaring the firm a monopolist before releasing any findings. That doesn’t bode well. The group even said in its most recent quarterly earnings statement that it expects to lose its NDRC case. That could lead to potential fines or a ruling that restricts the amount Qualcomm can charge manufacturers to use its patented technology related to 3G and 4G wireless networks. What’s worse, the company said some Chinese device makers, probably small firms that only sell domestically, are already avoiding paying the group high-margin royalty payments. That could have a big impact. The company said it may be due royalties on an estimated 1.3 billion devices set to be shipped in 2014, but said it expects to receive fees from as few as 1.04 billion devices. If the next two quarters’ licensing revenue is the same as the past two, Qualcomm should make $7.75 billion on the 1.04 billion devices manufacturers will report, or $7.45 per handset. If its assessment of around 260 million unlicensed wireless devices is accurate, that’s $1.9 billion of lost revenue. Qualcomm lost some $9 billion in value as its shares fell on July 24. But it’s hard to see how things can get better, especially when rivals like Taiwan’s Mediatek are also selling chips for new 4G smartphones. With political obstacles for U.S. tech companies in China only growing and a potential legal loss on the way, more China-related torment looks likely. Visitors walk past the Qualcomm stand at the Mobile World Congress in Barcelona, February 24, 2014. 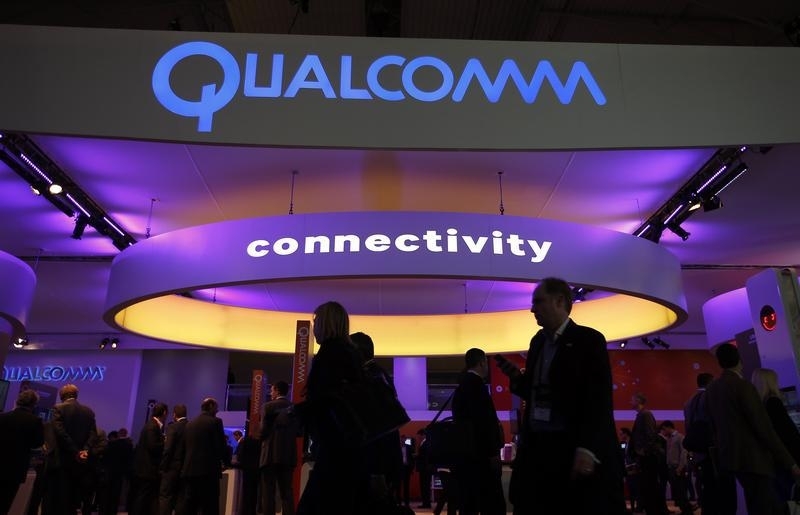 China’s antitrust regulator responsible for policing market dominance, the National Development and Reform Commission (NDRC), has decided U.S. chipmaker Qualcomm has a monopoly in China, local newspaper Securities Times reported on July 24. China Daily reported on July 24 that an NDRC investigation into the group would be concluded soon. Qualcomm disclosed the NDRC investigation on Nov. 25. The regulator is looking into whether the group used its monopoly status to price patent licences unfairly, according to people familiar with the matter. Patent licences allow phone manufacturers to make handsets running on common wireless standards for which Qualcomm holds rights. Under China’s 2008 anti-monopoly law the NDRC can impose fines of between 1 and 10 percent of a company’s revenues for the previous year if it finds the company abused its market dominance. On July 23, Qualcomm reported revenues for the quarter ending June. Group revenue was $6.8 billion, up 9 percent from the same period last year. But the group lowered its outlook for its patent licencing business since some Chinese companies have refused to pay the chipmaker royalties. Qualcomm said it estimates there will be 1.3 billion shipments of 3G and 4G devices in 2014, but only 1.04 to 1.13 billion will be reported to the group, and thereby pay license fees. In its quarterly filing, Qualcomm also said it expects a “loss is probable” in its antitrust case with China’s NDRC, but could not predict a potential fine. For the year ending September 2013, 49 percent of Qualcomm’s revenue came from China. Qualcomm shares closed down 6.65 percent on July 24 to $76.17.